Triboard TGV is a 3-layered panel with a wood strand core sandwiched between an MDF outer “skins”. The result is a clean-lined panel that has high resilience and impact resistance than other similar products. The dimensionally stable core gives the assurance of superior screw holding ability over other commonly used wall linings means screws will not loosen over time, giving a lasting performance. The MDF surfaces offers a grade 5+ paint finish capability, so you’re free to decorate it whichever way you choose. This innovative combination of smooth surfaces with inner strength makes it ideal as an alternative to traditional wall lining products. Triboard TGV complies with the New Zealand Building Code and is accepted by all councils in New Zealand. Avoid damage to the sheet face and edges and keep the panels clean to avoid stains. Always stack horizontally, supported by gluts at 1200mm maximum centers, and laid on a flat, level and dry surface. Protect from direct sunlight whilst in storage. For short-term storage on site, protect from direct weather exposure with tarpaulins or similar. Prior to painting or priming the panels, all dust should be removed from the surface of the board. 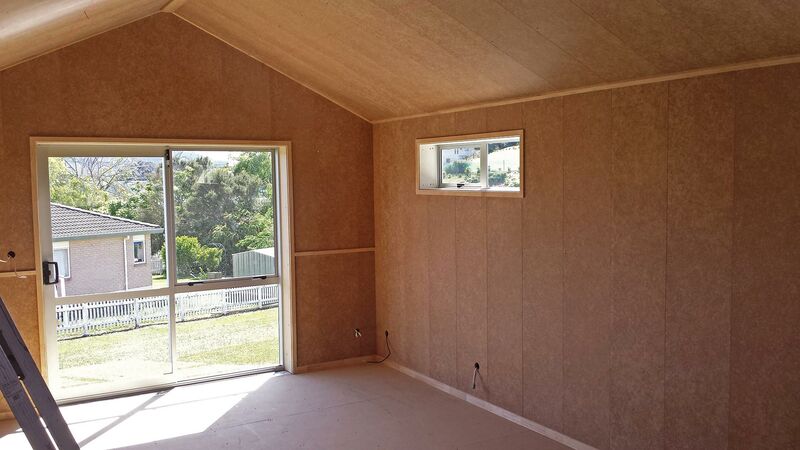 Triboard can be used for internal wall linings in pole sheds, beach houses, garage, sheds, workshops where high impact resistance is required.